Just as there are two generally recognized ways of reasoning—inductive and deductive—there are two similar ways of organizing your interviews. A third way combines both inductive and deductive patterns. 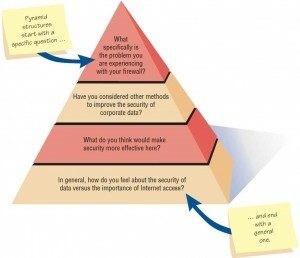 Inductive organization of interview questions can be visualized as having a pyramid shape. Using this form, the interviewer begins with very detailed, often closed, questions. The interviewer then expands the topics by allowing open-ended questions and more generalized responses, as shown in Figure 1 below. Figure 1 – Pyramid structure for interviewing goes from specific to general questions. In the second kind of structure, the interviewer takes a deductive approach by beginning with generalized, open-ended questions and then narrowing the possible responses by using closed questions. This interview structure can be thought of as funnel shaped, as that depicted in Figure 2. Using the funnel structure method provides an easy, nonthreatening way to begin an interview. A funnel-shaped question sequence is also useful when the interviewee feels emotional about the topic and needs freedom to express those emotions. 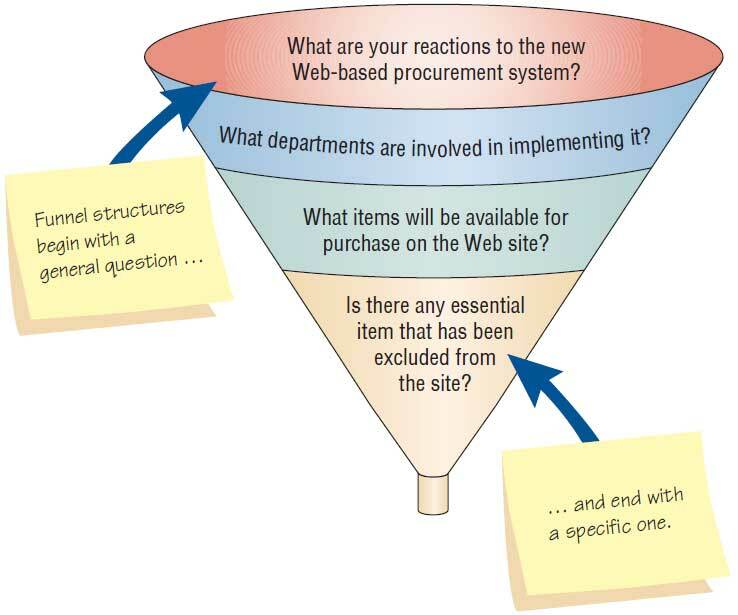 Figure 2 – Funnel structure for interviewing begins with broad questions, then funnels to specific questions. Often a combination of the two structures, resulting in a diamond-shaped interview structure, is best. This structure entails beginning in a very specific way, then examining general issues, and finally coming to a very specific conclusion, as shown in Figure 3. 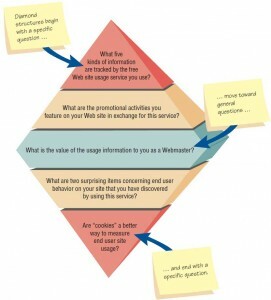 Figure 3 – Diamond-shaped structure for interviewing combines the pyramid and funnel structures. The interviewer begins with easy, closed questions that provide a warm-up to the interview process. In the middle of the interview, the interviewee is asked for opinions on broad topics that obviously have no “right” answer. The interviewer then narrows the questions again to get specific questions answered, thus providing closure for both the interviewee and the interviewer. The diamond structure combines the strengths of the other two approaches but has the disadvantage of taking longer than either other structure. The end of the interview is a natural place to ask one key question: “Is there anything we haven’t touched on that you feel is important for me to know?” Considered a formula question by the interviewee most of the time, the response will often be “No.” You are interested in the other times, when this question opens the proverbial floodgates and much new data are presented, though. As you conclude the interview, summarize and provide feedback on your overall impressions. Inform the interviewee about the subsequent steps to take and what you and other team members will do next.Ask the interviewee with whom you should talk next. Set up future appointment times for follow-up interviews, thank the interviewee for his or her time, and shake hands.